September and a lot of October can be more difficult for speckled trout anglers than Quantum Physics. And, as it’s shaping up this year, the lack of cold fronts will mean giant groups of specks will be challenging to locate. So, instead of beating your head against the wall, sight-fishing reds is an addictive sport that’ll make you forget all about the speckled trout. One of the keys to locating probable places that hold redfish is to find grassy, shallow duck ponds. The right amount of grass is important, however. Too much grass, and the trolling motor will be clogged with vegetation. Too little grass, and spotting the redfish will be like trying to see a single speck of dust. Hydrilla and neon green snot grass are the two best varieties to find. The grass filters the water clean, and it also hides the bait. Because grassy ponds are a necessity, using weedless presentations is extremely advantageous. There are ponds you can get away with an open-hook jighead, but a weedless presentation is your safest bet. The last thing you want to happen is for the jighead to catch grass right after you’ve pitched at the red. 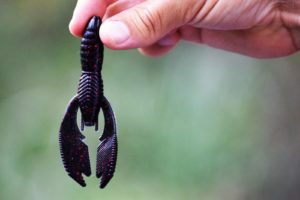 Redfish feed on a lot of crabs, mullet and crawfish in the brackish, backwater ponds, so the best bait to pair with the weedless, ¼-ounce hook is a crawfish imitator, like the Matrix Craw. The Matrix Craw comes in a solid white color, white lightning, which allows you to tell when the redfish has the lure in its mouth. The Matrix Craw can also be buzzed on the surface, as the pinchers give it a Ribbit frog look. This can be especially effective when either it’s too early in the morning to sight fish, or you’re having trouble seeing the fish. Another important element of sight fishing is to elevate yourself on some type of platform. If you don’t own a casting platform, a tall ice chest will suffice. The purpose of this is being high allows you to see into the water a whole lot better, which in turn, allows you to see more redfish. Oh, and don’t even attempt to go sight-fishing if you don’t own a good pair of polarized sunglasses, like the Matrix Mirrors. If you leave them at home, you’ll be squinting harder than an old man coming back from the eye doctor, but more importantly, you won’t be able to see into the water. Capt. Chas Champagne is an avid angler, located in Slidell, LA. Capt. Chas owns and operates Dockside Bait & Tackle and also manufactures his own tackle producing the Matrix Shad fishing lure and the Golden Eye jig heads.